On Aritic PinPoint you can check your website and domain rank when you will check the reputation of your Domain/Website. 4. Enter the given fields to create the “New keyword”. 5. Click on ” SAVE” . 6. At here you can able to see the domain ranking status in “Aritic PinPoint” keywords Mangement. 8. On the top right corner of Aritic PinPoint Dashboard, Click on“MANAGE WEBSITE”. 9. Enter the given fields to create the “Website”. 11. Click on “Social Report”. 12. 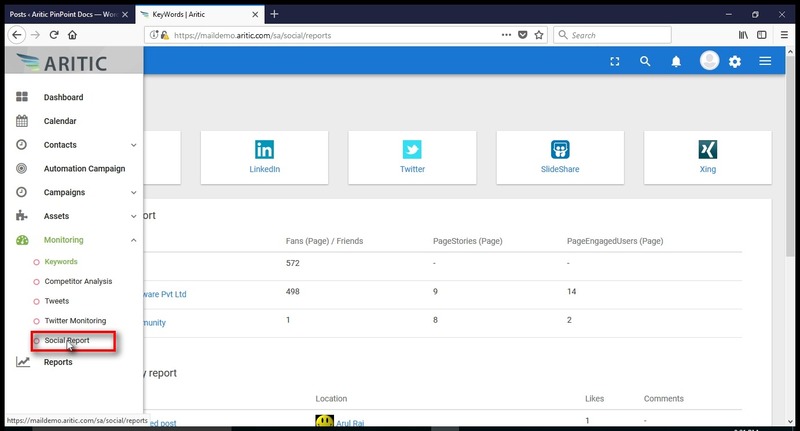 At here you can see that your followers on Facebook, LinkedIn, Twitter, SlideShare, and Xing.Who have following you, How many friends you have on social websites?